In sport, as in life, many factors combine to impact performance. One of the critical factors is the role of the leader, the person who sets the tone, the culture, and an expectation of what should happen. How clearly we see this in the arrival of Ole Gunnar Solskjær (b. 1973) as caretaker coach at Manchester United in December 2018. Working with the same squad of players, the former United striker has transformed a struggling team into winners. His record of eight wins from his first eight matches surpasses even that of his mentor, Sir Alex Ferguson, who started with a defeat and draw before clinching his first win. It was Sir Alex who brought Solskjær to Old Trafford at the start of the 1996/97 season, and the Norwegian would represent the club 235 times over a 12-year period, scoring 91 goals and winning six premierships. The so-called ‘Baby-faced Assasin’ was also capped 67 times for his country. 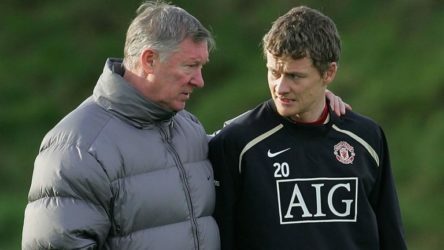 When injury ended his playing career in 2007, Solskjær served United as a coach, ambassador and reserve team manager until 2011. He then managed Norwegian club Molde (for whom he had played before joining United) and Cardiff City, before answering the call to return to Old Trafford for as caretaker/manager for the remainder of the 2018/19 season. This followed the sacking of José Mourinho, ‘the Special One’, whose time at United proved not to have been that special. Following Ferguson retirement in 2013, United struggled to find the right leadership. David Moyes won the Community Shield in his first match in charge, but lasted only 10 months before being sacked (iconic player Ryan Giggs took charge for the last four matches of the 2013/14 season). The United Board then appointed the highly renowned Louis van Gaal as manager, but in two years he could only deliver one FA Cup trophy, and he made way for the outspoken former Chelsea manager, José Mourinho. Mourinho was a surprising choice for United. While he had achieved considerable success in England and elsewhere in Europe, he was never a particularly pleasant person to to deal with. He was often detached and morose, and did not appear to be particularly interested in others – players, staff and external stakeholders, including the media. His unpredictability, sense of self-importance and his defensive tactics (totally different to the traditional flamboyance of earlier United sides) proved very unpopular with fans and decision-makers alike. The start of the 2018/19 season proved to be United’s worst opening in 28 years (the season in which Ferguson was one match away from being fired). Rumours ran rampant that Mourinho had ‘lost the dressing room’, i.e. the respect and support of his senior players, and in particular the mercurial Frenchman, Paul Pogba. He publicly criticised the Board (who had just extended his contract to 2020) for not supporting him in the transfer market, and behaved as though he was bigger than the club. And then he left star players on the bench in vital matches. A 1-3 defeat against arch rivals Liverpool was the last straw, and on 18 December 2018 Manchester United’s chairman, Ed Woodward, announced that Mourinho would leave the club with immediate effect. Ironically, Mourinho’s win record was only marginally below that of Sir Alex. His 84 from 244 represented a 58% win ratio, whereas Ferguson boasted 59%. But when leaders lose the confidence and trust of their followers and supporters, there is no come back. Within a day of Mourinho’s departure, the Club announced former player Ole Gunnar Solskjær as the caretaker manager until the end of the season. Unlike Moyes, van Gaal and Mourinho, Solskjær was a United man. He was part of the 1999 Treble side, an extremely popular figure because of the many crucial goals he scored, often after coming on as a substitute. He had coached and worked with the United staff, and served as a patron of the Manchester United Supporters Trust. * Mike Phelan was Assistant Manager under Ferguson, until David Moyes replaced the entire coaching staff. While it is still early days, the change in leadership has invigorated the players and brought hope to the supporters. As Reserve coach Solskjær had won four trophies – but more importantly, he had the respect of his players who wanted to perform for him. In the senior team that same sense of optimism seems to have taken hold. United won their first eight matches in a row, and a spirited fight-back from 0-2 down to draw against Burnley in the final eight minutes of the ninth match give fans hope that Manchester United will once again return to their free-scoring approach to matches and their winning ways. Same players, new leadership, new attitude. Leadership makes the difference.